It could be assumed that I “got it out of my system” by hiking the Appalachian Trail and riding a bicycle from Seattle to Key West… doubtful. Round 3. In the true form of adventure, I’m already experiencing a first on this go-round. I’m writing this with a bag of ice under my leg trying to fight off a calf strain. First time on one of these “trips” that I’ve needed to take time off due to injury. My doctor (me) prescribed rum (I knew I could find another use for that bag of ice I bought for my leg!) so sorry if there are any misspellings. Please be sure to note ALL of them in comments below. – The same distance as walking from Washington D.C. to Los Angeles or from New Orleans to New York and BACK (I would walk to NOLA for the food). – It is the equivalent of doing 101 marathons (oh now it sounds easy). – Goes through 3 primary regions: Mojave Desert, Sierra Nevada Mountains, and the Cascade Range. – The lowest point is 140 ft in elevation. – The highest point is Mount Whitney which is the highest point in the lower 48 states and stands at 14,505. – It will take approximately 5.5 months to complete. – Around 4,000 people are attempting to hike the entire PCT this year and under 20% will finish. Don’t get your hopes up on me being in that 20%. It’s hot. Q: If you are in the wilderness, what do you eat?! A: I hunt and forage EVERYTHING… (Please ignore every upcoming statement and continue to believe that if you would prefer.) Draw an imaginary line across the country in any direction. Roads will indefinitely cross that line. When I arrive at a road crossing I put my thumb in the air, show a little leg (crucial), and hitchhike to the closest town (MAYBE this town will have more than one podunk gas station… NOPE, a week of snickers and bugles it is). Q: What do you carry for protection? Alabama version of said question: What kinda guns (yes, plural) you bringin’? 1. Both of those items would just piss off a grizzly bear. 2. If a rattlesnake kills me, it’s because I never saw it coming. 3. “Crazy people” don’t climb 9,000ft mountains with the proper equipment to fulfill their serial killer tendencies. 4. Since the actual #1 killer is lightning, I’m pretty sure both of these fully metal items hurt my survival rate. Q: Do you do this alone? A: Yes and no. 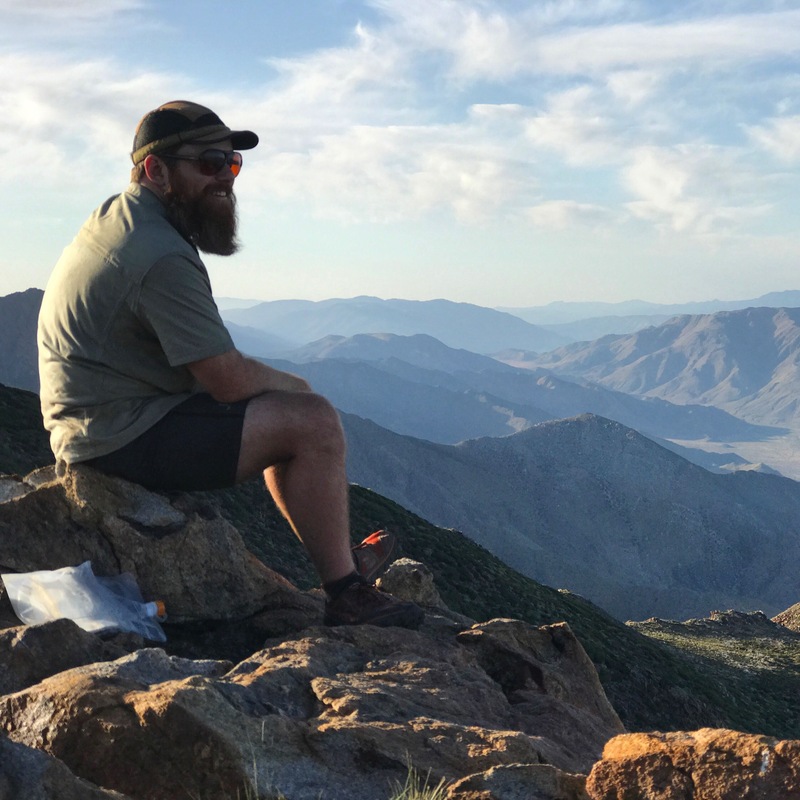 It is very much a personal journey but two factors make the answer “no” more than “yes.” First, I previously mentioned that 4,000 people will attempt to hike the entire trail this year (if I didn’t, now you know). There is an approximate two month window that you can start due to weather conditions. So at the beginning there are definitely people around you. Secondly, through previous travels, I’m fortunate enough to share the acquaintance of people who are equally crazy as I. My loyal readers will certainly remember the names “Boo Boo” and “Michigan”. I’ll fill you in on those hooligans and others in the upcoming blog. – The beginning point of the trail offers the amenity of a barbed wire fence that separates you from the luxurious Trump wall by about 30 feet. Unacceptable. I’m touching that wall. I find an opening, molest the wall for enough time to take an immaculate photo, and run at first sight of a border patrol helicopter. – One morning, Boo Boo puts on his shoes and proclaims “I think my shoes shrank 2 sizes overnight.” I look around and my shoes are missing. “Damn it Boo Boo, take my shoes off!” He proceeds to remove my (now extremely stretched out) shoes only to reveal that he was failing to wear any socks. Perfect. – So apparently, I run with the loud/late crew. Night two, 8:15pm, we are playing cards after dinner. Out of a tent that showed up after us, (we were here first!!!) yells a thick German accent scent “GO TO SLEEP!” I suppose I missed the memo on hiker midnight being 8pm. – Speaking of foreigners, I come across a group of 3 French hikers stomping toward me on the trail. I’ve already met this crew and know they are going the wrong direction. One of the guys proceeds to ask me if they are going the wrong way. I politely inform him which way is which. He responds (in a thick/angry French accent) “I know where Canada is! You make me sound like an idiot!” I just can’t win with these people. – One evening, we find a good/secret campsite off trail. We are beyond surprised to find that there is unused firewood set up and an unopened gallon of water sitting beside it. We tell this story to a local in the next town. It turns out that this prepared fire and water was almost definitely set up by a coyote. What’s a coyote? Someone that is paid to help get illegal immigrants sneak into the United States from Mexico. I suppose we ruined someone’s fire/water break… Oops. I suppose that’s about all for now. Thanks to all you beautiful souls for tuning in. PLEASE ask any ridiculous questions you might have to help fulfill my upcoming FAQ section. If you are at all interested in my real-time location, (I’ve upgraded to a crew of messenger pigeons for this adventure!) check out the “current location” tab on the homepage of tylerrossadventures.com. I’ll be doing one of these every 3 weeks or so don’t think I have been eaten by a grizzly bear in the meantime. Awesome! I hope to hike the PCT someday and make as much humor and fun out of the trek as you are. Looking forward to more. Would you be interested in a liquid care package from Bham? If so, send me an address you can pick up from along the way and a time frame you’ll be in that area. Good luck! I love it!!! Thanks for sharing — an inspiration for sure!!! Keep self medicating and stay well <3! – Around 4,000 people are attempting to hike the entire PCT this year and under 20% will finish. Don’t get your hopes up on me bring in that 20%. It’s hot.. change "bring" to "being "
Great adventure details! Can’t wait for more! I wish I could share with you the cream cheese wontons I’m currently eating. I think they’d be pretty good trail fuel. I’m about to go running, so I like to think I’m maintaining fitness to be able tag along with you once you’ve planed your next quest. Maybe the Andes. No big deal, just 4,500 miles. It’ll be a breeze. Does the real trail actually start in Mexico? If the answer is yes than just lie to me because I will be disappointed otherwise. Tyler, make the most of it and when you doubt yourself, just remember if Reese Witherspoon can do it, so can you !! 😬😳Seriously, proud of you !! You’re the man! Although I would have taken a knife….. Not for use as a weapon but for everyday needs. I mean if there’s nothing to do you can always whittle on a stick! Haha good luck brother, see you soon! How’d you get ice in the desert?! What in tarnations?! I always try to act more confused than the Europeans I’m trying to help, and they seem to find their own way, anyways… Carry on! Is there a little dreaded red head around? She’s my niece. Tell the dogs said hello…..Snacks will be waiting at the next spot…. That would be tell HER the dogs said hello…. I have been wondering how you get your pack down to 13 lbs. You just revealed you don’t pack food! How about “Tales from the Trail”? (Instead of Trail Tidbits). This is Great! I really enjoy reading your stories. Stay safe and enjoy your trip. Can’t wait to read more. I wanna make it clear that I am not, repeat not, the great uncle of this boisterous miscreant. I used to have a beard like his, but had the good sense to shave it off and get civilized. John Muir notwithstanding, a Scotsman oughta know better than to ramble around the country and stir up trouble and confusion. I Love the BLOG!! I am so proud of you, keep them coming, and as always BE CAREFUL! !